The surprisingly poetic canvas by Ivan Shishkin “Mordvin Oaks” was created near St. Petersburg. Summer sunny days at the artist were busy entirely. Like a worker at the machine, he came to these oaks and wrote out almost every piece with special care. Such detail was not peculiar to the artists of his period, but Ivan Shishkin already had his own style and, of course, his own passions. Most of all, judging by the canvases, the artist loved oaks and pines. And those and other trees are powerful in their own way. Oak personifies remarkable strength, and pine – to become unprecedented. Two huge oak trees, widely spreading their branches, are lit by a generous summer sun, judging by the yellow tones, it is already after noon, but it is still far from dusk. And surprisingly, it is warmly felt almost physically from just one look at the picture. It seems that there will be a breeze, and the leaves on the giant trees will rustle. 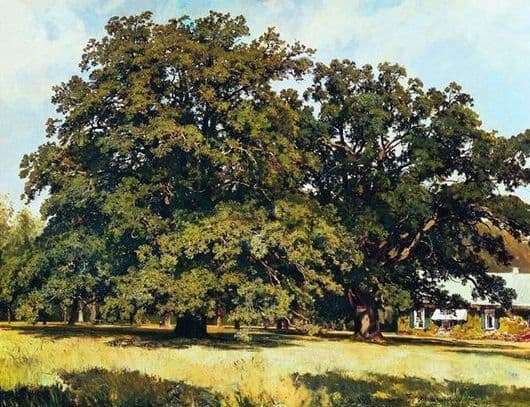 By recognition of contemporaries, Shishkin came to drink these oaks at exactly the same hour, so that the light fell on them in the same way, and at another time of the day he was writing several more works in parallel with it. In the mornings – a cornfield, in the evenings – a pond. This is the secret of the artist’s fertility. He himself believed that inspiration would certainly come during the work itself, one has only to get into nature. And in the vicinity of Peterhof, nature provides rich soil for the painter. The main thing is to choose a point, to feel the composition. In this picture, behind the oaks, there is a yellow house with green shutters and a visor above the entrance. It has open windows – on the street heat. Behind the house – yellowed crowns, apparently, from the heat. Only two mighty oak trees hold, their foliage is still green. Only here and there bare branches appear through. In the shade of such a tree you can hide from the scorching rays of the sun. But how to guess: did the master work on the picture in the sun or hid under the same exact oak? Most likely the second: this is indicated by the shadows at the very bottom of the picture.